For the fourth successive year, C.K TOOLS says it has launched its annual Winter Wonderland promotion and with more deals than ever before, the promotion will be the most successful to date and is now well underway. 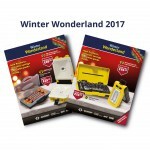 The company says containing over 150 products, Winter Wonderland 2017 includes newly launched ranges and added value products to new kits and some of the company’s most popular tools and accessories and also offering fantastic discounts across C.K tools, C.K Magma, Kasp and Avit ranges, the promotion will give tradesmen great value. New product launches to be added to this year’s promotions include the new range of C.K Waterpump Pliers in 175, 250 & 300mm sizes available from just £22.99 (ex VAT).